The plan for capture of Lae was in the nature of a pincer, the 9th Division would make an amphibious landing east of the town and then advance upon it along the coast and the 7th Division would be flown into Nadzab in the Markham Valley and advance on Lae from the west. The 5th Division would continue its operations west of Salamaua to divert Japanese attention from Lae. The 9th Australian Division landed east of Lae on 4 September, and began the advance. Nadzab airstrip was captured by the 503rd United States Parachute Regiment on 5 September and the first planeloads of the 7th Division began landing on 7 September. Troops from both divisions reached Lae on 16 September although the troops of the 7th had the honour of being first into the town. Around 1,500 Japanese were killed in the operation and another 2,000 taken prisoner, but close to 6,500 managed to escape, despite the 21st Australian Brigade being moved into positions to block their path. The 9th Division suffered 150 fatal casualties in the operation and the 7th 38 in the actual fighting and 59 in an aircraft accident, involving the 2/33rd Battalion, at Port Moresby. Lae was subsequently developed as a major base. Salamaua was captured by the 5th Division on 11 September. The next major objective for the 9th Division was the Japanese forward supply base at Finschhafen. On 22 September, the Australians made a second amphibious landing at Scarlet Beach and Finschhafen was captured in early October. The Australians then moved against Sattelberg Mountain, the dominant feature overlooking the coast but this operation was delayed when the Japanese 20th Division counter attacked. The counter attack failed and after hard fighting, the Australians captured Sattelberg on 27 November. The 9th Division’s final object was Sio, on the northern end of the Huon Peninsula, which fell on 15 January 1944. The 7th Division objective was the control of the combined Markham and Ramu River Valleys, a 185 kilometre long flat corridor hemmed in to the north and south by towering mountains. Operations to control the valleys began with the seizure of Kaipit on 19-20 September 1943. 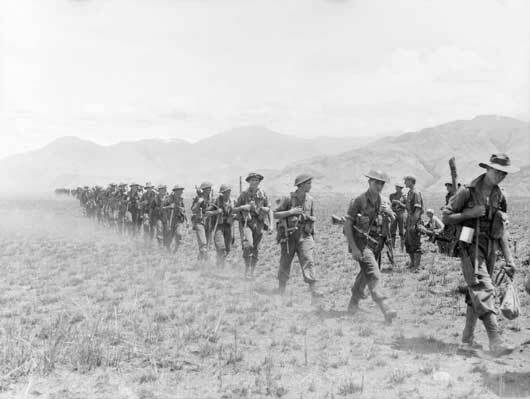 The 7th Division advanced from the head of the Markham Valley into the lower reaches of the Ramu. Dumpu was captured on 4 October. 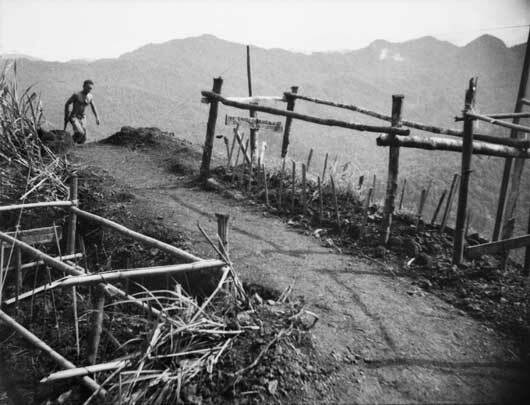 The Japanese were forced back onto their main defensive positions on Shaggy Ridge, and it was December before the 7th Division had built up sufficient stores, and was given permission, to commence attacks on the defences. On 27 December, the 2/16th Battalion captured the Pimple at the south-eastern end of the Ridge. This was followed on 19 January 1944 by the main operation to capture Shaggy Ridge which was completed on 26 January. In April 1944, the capture of the Huon Peninsula was completed when the Australians captured Madang. 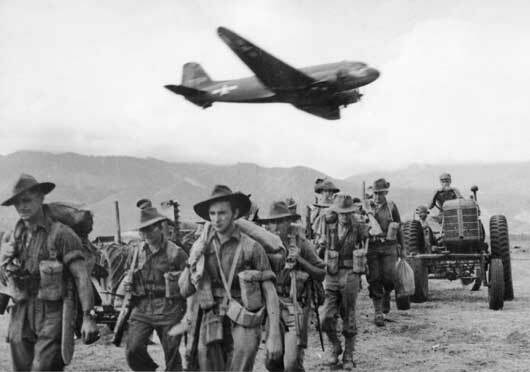 Material being brought in by aircraft as Australian soldiers make their advance on Lae (AWM 015816). 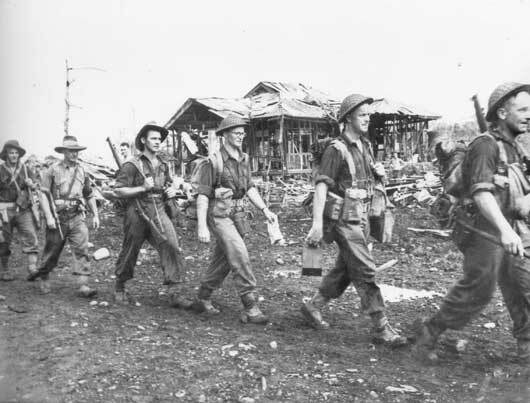 Australian troops file into bomb blasted Lae following its re-capture from the Japanese (AWM 015826). 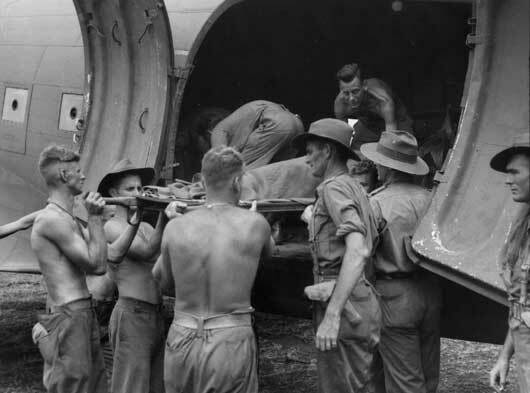 A wounded Australian being loaded into an aircraft for transport back to a base hospital (AWM 057015). The 2/27th Australian Infantry Battalion, moving forward across the valley (AWM 058650). 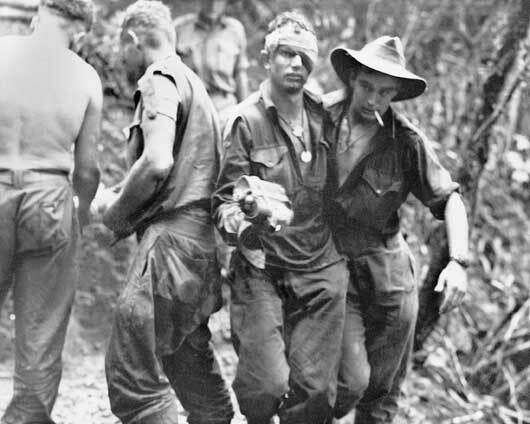 A wounded soldier of the 2/16th Australian Infantry Battalion being assisted to the regimental aid post during the attack on Shaggy Ridge (AWM 062294). The graves of Australian soldiers killed in action at Shaggy Ridge (AWM 070005). 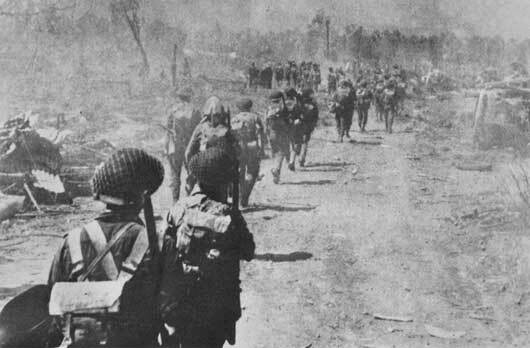 Troops of the 7th Division entering Lae along a road littered with debris from air and artillery bombardments (AWM 128389).